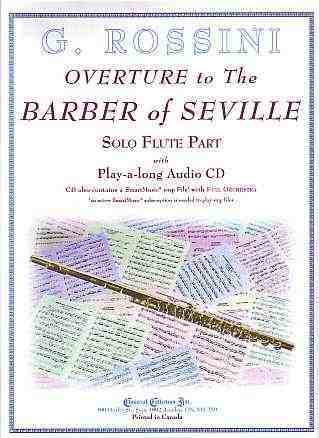 The Overture to The Barber of Seville is presented as a Solo for Flute, Clarinet or Alto Saxophone with a play-a-long Audio CD which also contains a SmartMusic SMP File. Duets Books and Piano Accompaniment Books are also available. Gioachino Antonio Rossini, composer, was born on February 29, 1792 in Pesaro, Italy and died on November 13, 1868 in Passy, France. In his youth he was a singer and also studied the Cello and Piano. He was without doubt the greatest Italian composer in the first half of the Nineteenth Century. 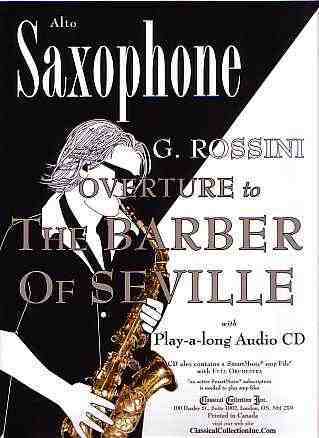 Rossini composed a wide variety of music including several Masses and Cantatas but he is best known for his 39 operas. The first, Demetrio e Polibio, was written in 1807 (not performed until 1812) but his last opera, William Tell, was composed in 1829 - almost 40 years before his death! 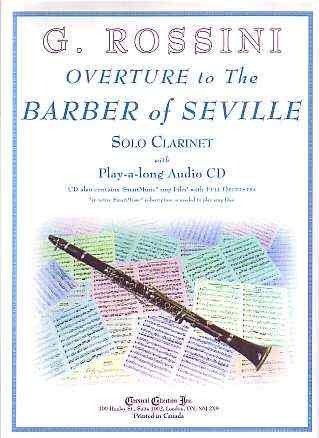 No autograph copy exists of the score to the Overture to The Barber of Seville. It was originally written for the opera Auleliano in Palmira (1813) then adapted for another opera (Elisabetta, Regina d’Inghilterra, 1815) before being used for The Barber of Seville (1816). In the opening section of this arrangement of the Overture to The Barber of Seville, to avoid the use of 32nd notes and make the work appear less intimidating, all of the rhythmic values have been doubled (originally 24 bars, now 48). The meter has remained 4/4 but the quarter note is now “the beat” rather than the eighth note. In addition, to make for more “friendly” key signatures, the entire piece has been transposed up a semi tone from Concert E (Major and Minor) to Concert F (Major and Minor). The Clarinet Book CD contains Audio and SmartMusic versions for both Bb Clarinet and Clarinet in A, for Clarinetists who want to play the work in the original key.